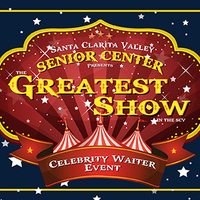 We will be holding this year’s annual Celebrity Waiter Dinner: The Greatest Show in the SCV! on Saturday, February 23, 2019, at the Sand Canyon Country Club. This event is a great opportunity for you and your guests to have a night out on the town and enjoy some great music, while also supporting the important programs and services of the Santa Clarita Valley Senior Center.